Thanks to Shantelle for sending this in! 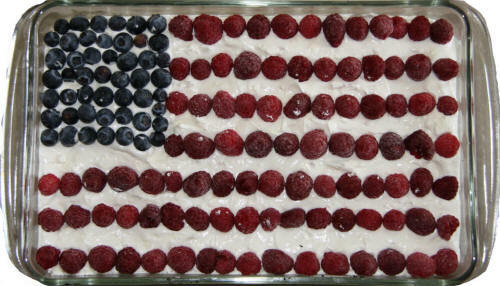 Basically, you're going to be making a 9x11 inch cake (9x13 would work too), covering it with white icing and then garnishing it with blueberries and raspberries so it looks like a flag. Note: There are seven raspberry stripes. The bottom of the blueberry square ends at the fourth stripe from the top. The type of cake you use can be whatever you prefer -- here are a few suggestions. store bought White cake mix (chocolate cake mix works too for all you chocolate lovers). Kimberly (another viewer) adds the following tip: "P.S. I found it easier to remove the cake in one piece from the pan when I buttered the bottom of the pan and sprinkled on flour before putting the batter in." Ice the cake with vanilla icing. 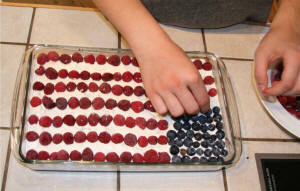 Decorate with blueberries and raspberries so it looks like a flag. 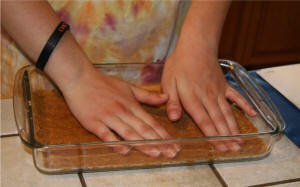 Very easy for kids to make -- there's no baking or cooking involved!! Make 1 day in advance so it has time to firm up. There is a printable version of this recipe. 2 envelopes dream whip (prepared according to pkg directions -- it takes milk and vanilla to prepare it, so make sure you have those in the house too). 8 oz pkg cream cheese. Crumble crumbs and margarine together and pat firmly into a 9x11 pan. 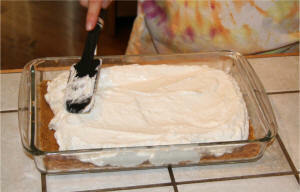 Combine the PREPARED dream whip, cream cheese and icing sugar and beat with an electric beater at LOW SPEED. Don't beat it to death -- a few little cream cheese lumps makes the cake extra yummy. Spread over the base, smoothing it out as much as possible. Put in fridge for at least 12 hours (otherwise your fruit may sink into the cake when you decorate).